Impact Wrestling’s road to Rebellion continued from St. Clair College Sportsplex in Windsor, Ontario, Canada. 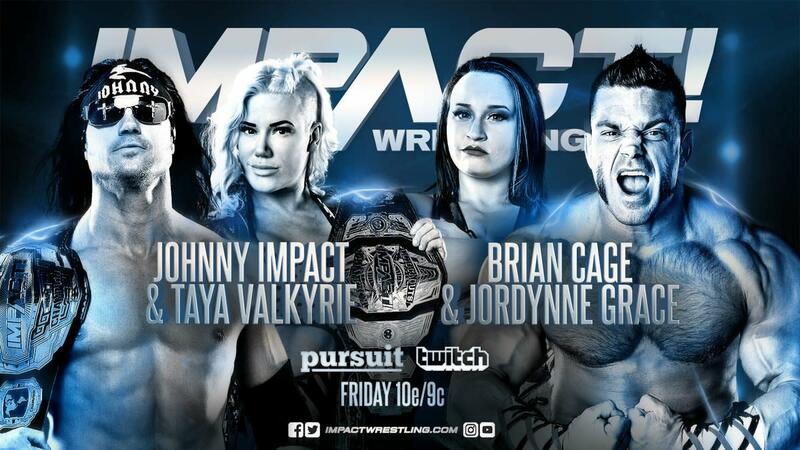 The opening video recapped last week's show and gave us the build to tonight's main event of Johnny Impact & Taya Valkyrie vs. Brian Cage & Jordynne Grace. This week's Twitch stream was hosted by Don Callis. Melissa Santos was out of commission due to a knee injury. Out of the norm, The Rascalz decided to stay at ringside for Wentz’s match. Moose mocked Wentz before the match and bullied him, provoking Wentz to go for the first strike. Wentz went for wrist control, but Moose easily overpowered him and chopped him. Wentz took advantage of Moose playing to the crowd to kick him, send him outside, and hit a moonsault to the outside that Moose caught. Moose got sent to the ring post instead. Wentz hit a couple of running strikes, but Moose again powered himself back and hit a couple of impressive dropkicks. Moose worked over Wentz for the next few minutes, using mostly strikes and tossing him around the ring. But once again, Moose got cocky and started playing more to the crowd and getting distracted with the referee. Wentz found himself outside, where Moose pursued and went for an apron bomb, but instead swept the leg when Wentz tried to escape. Moose got cocky again, and this time Wentz had the opening to dive on Moose and finally rock him. Wentz hit a couple of running dropkicks, a striking combo, and a corkscrew plancha, but he only got a one count. He hit a knee to finally get Moose off his feet. Wentz went for a plancha, but Moose caught him and tossed him outside onto his partners. Back in the ring, Wentz got a couple more kicks in, but when he went for the kill, Moose caught him, hit the No Jackhammer Needed, and pinned him for the 1-2-3. Pretty good opener. Melissa Santos interviewed Madison Rayne about losing to Jordynne Grace and being back in Impact. Rayne said that she unfortunately lost, but she is back to win the Knockouts Championship and take on the competition. Tessa Blanchard interrupted her, talking trash about Rayne coming back to relive her glories and piggy backing on her. Blanchard said Rayne is just like Gail Kim. Rayne brought up that she has a winning record against Blanchard and challenged her to a match. Rosemary jumped Yung and started taking out each of the Undead Bridesmaids one by one. Rosemary kicked Yung to the outside, but the Bridesmaids saved her, so instead, Rosemary locked Yung in the Upside Down. Rosemary went for a spear in the corner, but Yung dodged and worked on Rosemary’s weak knee with several strikes and a single-leg Boston Crab. Yung went for a dragon leg whip to take down Rosemary, then used the opening to go for her dirty glove. Rosemary battled Yung, hitting a reverse DDT to get her away. They traded strikes and clotheslines. Rosemary hit a running knee for a two count. Yung came back with a palm strike, but Rosemary recovered and hit a German suplex. All the Bridesmaids got on the apron, and once again Rosemary went for them. Kiera Hogan came to Rosemary's aid, but they ended up arguing outside the ring because Rosemary didn't want Hogan’s help. All the Bridesmaids jumped them and the match ended in a no contest. After the match, the Bridesmaids tossed Rosemary back in the ring, where Yung locked in the Mandible Claw. Yung hit the Panic Switch on both Rosemary and Hogan to lay them out. We got a recap and backstage look of the United We Stand show in New Jersey and some comments from talent involved with the show. Ace Austin cut a promo about losing the six-way match from last week. He said that he was about to win, and blamed Aiden Prince for his loss. He challenged Prince to a match. Backstage, Killer Kross met with Willie Mack. Kross asked Mack if he liked jazz music. Kross got in Mack’s head by saying that Rich Swann was playing him for a fool. This is an interesting direction, with Kross trying to intervene in Swann’s affairs. We got a promo by The Deaners saying they’re headed to Impact and they’re getting focused. Good promo and promising gimmick. Commentary brought up Page and Alexander’s history together, but not as Monster Mafia. This match was a showcase for Alexander and the tag team work of The North. El Reverso had a hope spot on Alexander, but he stopped him with a Plunge before hitting a twisting facebuster double team. Page tagged in and hit a backbreaker on Reverso. Alexander came back in, locked in an ankle lock, and turned it into a powerbomb backbreaker. Reverso finally tagged in Jean. He had a good hot tag and hope spot, getting a two count on Page with a flying forearm. Reverso tried to make a stand against both men, but The North picked up the win over Reverso with a double-team maneuver. Great debut for Alexander. Back from commercial, The North cut a promo about them taking over the tag team division. Good promo by both men. Kim came down to the ring and joined commentary for the next match. Blanchard, right from the start, focused more on Kim outside the ring than Rayne, who took advantage of the distraction on several occasions. Blanchard got the upper hand on Rayne with a set of running forearms and dropkicks. Rayne came back with a couple of roll-ups, but Blanchard easily kicked out. Blanchard hit a brainbuster and went to choke out Rayne. Blanchard kept messing with Kim, striking Rayne right in front of the commentary table. Blanchard hit a corner Magnum, and once again talked trash to Kim instead of pinning Rayne. Back from commercial, Rayne and Blanchard exchanged strikes in the middle of the ring. Rayne hit an enzuigiri and a Northern Lights suplex for a one count. Blanchard hit a double underhook modification of the Bitter End for two. Rayne hit a crucifix bomb for a two count. She went for a reverse DDT, but Blanchard blocked it and hit a slingshot suplex, rebounding Rayne twice on the ropes for a two count. Blanchard hit a superplex for two. Blanchard went for a steel chair and attacked the referee, provoking Kim to take the chair away. It gave Rayne time to recover, and she blindsided Blanchard with a schoolboy to get the upset win. Melissa Santos interviewed Johnny Impact & Taya Valkyrie. They talked about tonight’s match against Brian Cage & Jordynne Grace. Johnny put over Cage as a wrestler, but then buried him for being one-of-a-kind dumb. Valkyrie provoked Santos by implying that Cage and Grace had an affair. We got an oVe cam promo. They were in some back alley. Sami Callihan cut a promo about giving Swann everything and now Swann will have nothing for betraying oVe. At Rebellion, Callihan will take the X-Division Championship. Blanchard cut a promo backstage on Kim. She said that she was only thinking of beating Kim at Rebellion, but now that Kim decided to interfere in her matches, it will be personal. This had WWE-style mixed tag match rules with the wrestlers having to pair up by gender, so Valkyrie started the match by trying to provoke Cage into a DQ -- but Grace was right there to take her on. Grace got the upper hand early with a series of shoulder tackles and clotheslines. She sent Valkyrie right into the corner and hit a running knee and a running elbow right before a Vader Bomb for a two count. Valkyrie finally got some space and went to Johnny for the tag, but Johnny actually got off the ring to avoid getting in the ring with Cage. Grace tagged in Cage instead, forcing Johnny to become legal. They did a small sequence with Johnny escaping Cage’s attacks and getting cheap shots in -- until Cage caught Johnny, curled with him, and tossed him like a rag doll. Johnny hit a springboard corkscrew, but got too cocky to follow up. Cage came back with a clothesline and a backdrop that over rotated Johnny. Johnny tried to find a way to tag Valkyrie, but Cage blocked him until Johnny simply poked Cage’s eyes and got the tag. Grace didn’t wait and rushed at Valkyrie in the corner, but Johnny was still there to aid his wife and give Valkyrie the opening for a shotgun dropkick. She stomped on Grace for a bit and went for an armbar submission and a curb stomp on the same arm. Valkyrie hit a running hip attack and the double knees for a two count. Grace hit a desperation running powerbomb. Valkyrie tried to make the tag to Johnny, but instead was talked into stopping Grace -- with Johnny again trying to avoid Cage. Valkyrie failed to stop Grace, so Johnny straight up went in to attack Grace, but it was too late as she tagged Cage back in. Cage ran wild on Johnny with a combo neckbreaker and a huge release German suplex for a two count. Cage went for the F5, but Johnny reversed it into a swinging neckbreaker for two. Johnny went for Starship Pain, but Cage caught him. Cage and Johnny took each other out with a lariat and a kick respectively. Grace and Valkyrie came in, with Grace hitting a German to throw Valkyrie to the outside. Grace followed with a tope suicida on Johnny, only to be taken out by Valkyrie. Cage then hit a tope con giro on Johnny, tossed him in the ring, and went for the Drill Claw. Suddenly, referee Johnny Bravo buckled Cage’s leg, giving Johnny the opening to hit a shining wizard and win via quick count. The referee got a lot of heat. After the match, Cage got back up and went after Bravo, but Valkyrie low blowed him and the couple beat up Cage. Johnny Bravo hugged with Johnny and Valkyrie.